In his career, Dave Barry has done just about everything - written bestselling nonfiction, won a Pulitzer Prize, seen his life turned into a television series. And now, at last, he has joined the long list of literary figures from Jane Austen to Tolstoy who have made the transition from humor columnist to novelist - and done it with a style and inventiveness that establishes that, yes, he is very good at that, too. In the city of Coconut Grove, Florida, these things happen: A struggling adman named Eliot Arnold drives home from a meeting with the Client From Hell. His teenage son, Matt, fills his Squirtmaster 9000 for his turn at a high school game called Killer. Matt''s intended victim, Jenny Herk, sits down in front of the TV with her mom for what she hopes will be a peaceful evening - for once. Jenny''s alcoholic and secretly embezzling stepfather, Arthur, emerges from the maid''s room, angry at being rebuffed - again. Henry and Leonard, two hit men from New Jersey, pull up to the Herks'' house for a real game of Killer - Arthur''s embezzlement apparently not having been quite so secret to his employers after all. And a homeless man named Puggy settles down for the night in a treehouse just inside the Herks'' yard. In a few minutes, a chain of events that will change the lives of each and every one of them will begin, and will leave some of them wiser, some of them deader, and some of them definitely looking for a new line of work. With a wicked wit, razor-sharp observations, rich characters, and a plot with more twists than the Inland Waterway, Dave Barry makes his debut a complete and utter triumph. 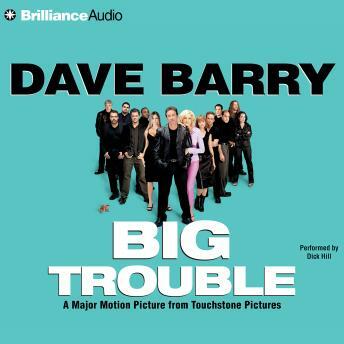 I always enjoyed Dave Barry's columns, but this audio book was a bomb! I found it difficult to follow and it just couldn't hold my interest. What a great, fun ride this book is! It was always interesting and funny...really funny. I was laughing out loud all the way home on my long ride from work. The characters were great. I just loved this story. Great book! I listened to it in one day...I took it to work, brought it home and spent most of the night listening to it. The plot moves fast and the one-liners are hysterical. Highly recommend it!